A loop is a block of statements that are repeated. A loop may be repeated a fixed number of times, repeat until some condition is met, or can loop indefinitely while the program is running. There are three main loop control structures available in Java: for, do and while. The most basic loop structure is the for loop. Shown below is an example of a for loop. In the above code, the for statement declares an integer variable i, and then tests i to see if it's less-than or equal-to 200 (i <= 200). Then it increases the value of i by 1 (increments i). If the test part of the statement where to resolve to true, program flow would exit the loop. In the for loop block of statements, each time the loop executes the value of the integer variable multiple is multiplied by 9. In the next line, the String object method valueOf changes the variable type from integer to string and stores it in the String object strI. In the next line the value of strI is concatenated onto the string outData. 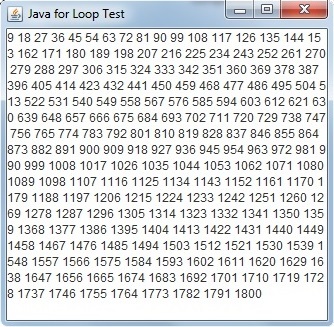 So, the resulting function of this for loop example is to create a string containing the first 200 multiples of 9, from 9 to 1,800 (9 x 200). Shown below is the complete code for an application that displays these multiples in a program window. In the code above, a JTextArea object named myTextis created, and the line myText.append(outData) places the outData string in the JTextArea for display in the program window.